Designed by Soluziona Architects in Spain, this house is an ideal family home if you have a lot of vertical space to work with. Volume, volume, volume is what it is all about! Designed and built in 2007 and 2008, the modern and contemporary styles of the 21st century were already playing a huge role. Futuristic and flawless, the architects have created four distinct volumes, which make up this fantastic house. Described as a, Very enjoyable, even fun job , the passion and love for architecture is evident in the final product here. Kevin McCloud once said, Every decently-made object, from a house to a lamp post to a bridge, spoon or egg cup, is not just a piece of 'stuff' but a physical embodiment of human energy, testimony to the magical ability of our species to take raw materials and turn them into things of use, value and beauty. This house is a testament to this quote. This angle shows how the different layers work together, resting on top of each other to create different volumes, shapes and spaces. The architects have tried to stay away from simple, clean lines and instead have opted for a play on the horizontal and vertical, breaking up these spaces. They have said that they wanted to create tension between the volumes and to clearly define the interior space from the exterior space. The exterior is finished in white concrete and is meant to stand out on the block as a defined piece of architecture. The result is a grand slab of building that is illuminated even from a distance. While many modern houses feature large, glass windows and doors, this house is a little bit more modest and subtle when it comes to the transition between the interior and the exterior, as mentioned above. The interior is meant to be private and protected. This is a fantastic feature for houses in South Africa, if you want to keep what goes on inside of your home private from any possible burglars. The perimeter fence also shows that safety is a feature in this home. The volumes of the home are clear from the interior as well as the exterior, where this angle shows how a second floor transitions into a ground floor via a floating staircase and a wide, open space. The second floor is more like a mezzanine or a gallery. This is very trendy! You'll notice that a chandelier hangs in this space, adding luxury and opulence to the home. A simple feature like this can change the whole look and feel of a house. The designers have connected the design throughout the interior with the use of neutral colours, including grey and white. Wood and glass also features prominently. Even the pictures and paintings on the wall are neutral—soft greys or blacks. The overall effect is a very elegant and sophisticated home. These colours and materials promote high quality and show that every last detail has been considered, so that all of the finishes are perfectly designed. 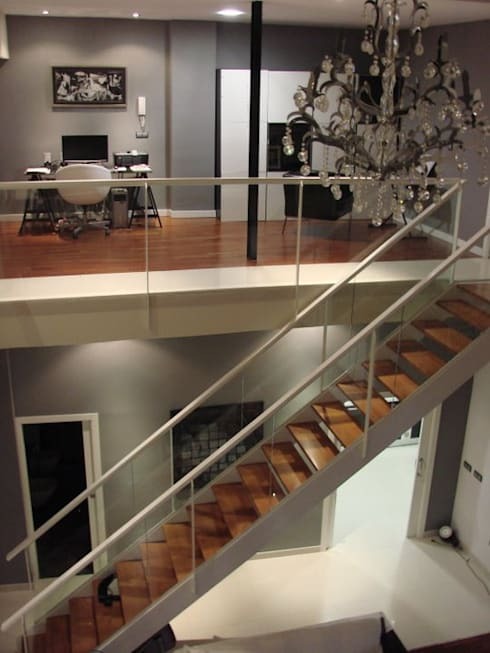 If you look over the balustrades on the second floor, you'll see a large and comfortable looking living room. Dark wooden floors enhance the warmth and cosiness of the room, while the neutral black, grey and white colours remain in terms of décor and design. The fancy appliances—a flat screen television, speakers and other gadgets—create a very modern and techno-friendly haven. This is truly a family home. Imagine curling up on the couch watching a movie here or reading your book on a Saturday afternoon? This is also a space for music, red wine and snacks in winter or card games and iced tea in summer. Comfort is key here. The cosy nature of this room is enhanced by the cushions and throws that have been added to the sofas. This is easy to recreate in your very own living room. Opt for some plush and cushy sofa accessories and you're set! If we move down into this room, we can see that wall art features on the wall here, adding funky design and a modern twist to this comfortable space. 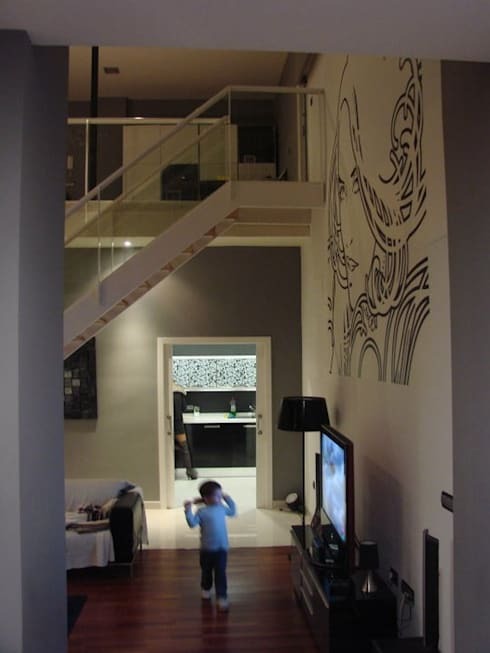 The walls are a great place to add design and style in any home so make sure that you utilise your own walls! Hang up paintings done by your favourite artists (even your favourite local artists!) or frame photographs of your favourite trips, family moments and important days, creating a photo wall. Wall art, like the art seen in this photograph, is also fantastic. You can use vinyl wall art stickers, which you simply peel off when you no longer want the art on the wall any more. No muss, no fuss! Fore more home décor inspiration, check out these tips to: Easily Transform Your Home With Temporary Decorating Ideas. 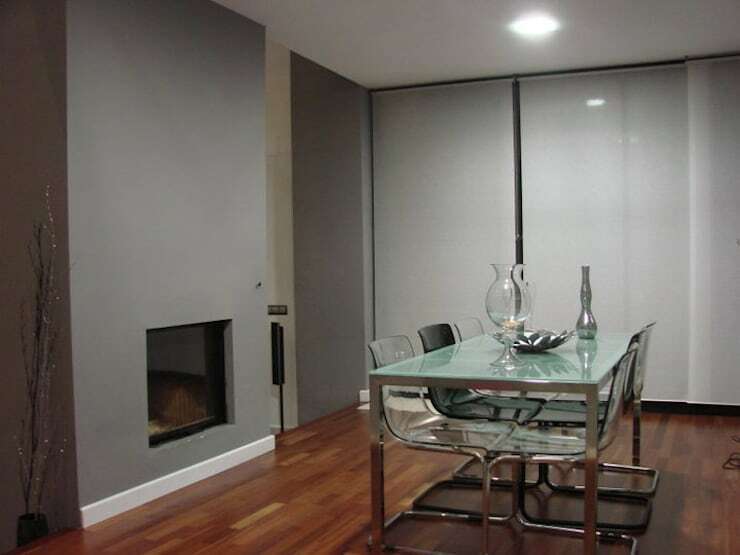 The dining room area shows how the beautiful greys and the use of glass materials complement each other fantastically. Sleek and sophisticated are the words that come to mind. The grey walls are offset by the gorgeous, dark wooden flooring. A fireplace is positioned in the wall here, providing a cosy dining area in winter. While South Africa doesn't experience winters like Europe does, fireplaces are still a fantastic option for any home, adding a soft glow and a wonderful warm environment during the colder months. Especially if you live in cities like Johannesburg, this is something to consider. The glass dining room table and the perspex chairs add a modern and edgy design to the room, without drawing away too much attention. Subtle design is the name of the elegance game. If you like this dining room table, check out: The Very Best Dining Table Tops. This little office space on the second floor of the home is worth admiring for a number of reasons. 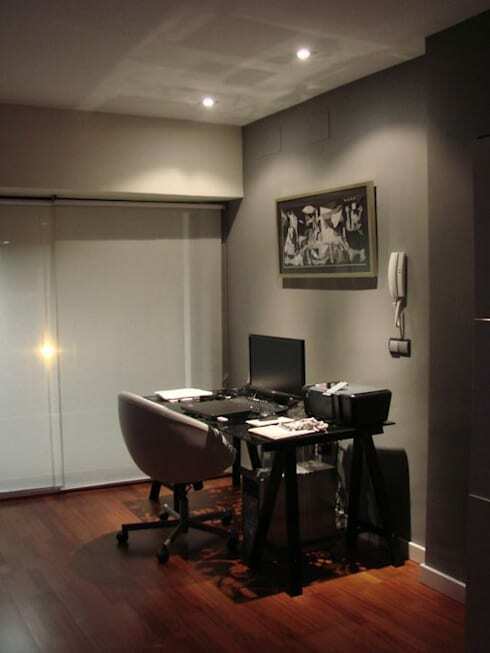 Firstly, it shows how a little office nook can be created in just about any space, utilising unused areas of a house. Function and style collide here. Just by adding a simple desk and chair to the corner of a space, you can create a whole, private office area for yourself. Office areas don't have to be boring, however. 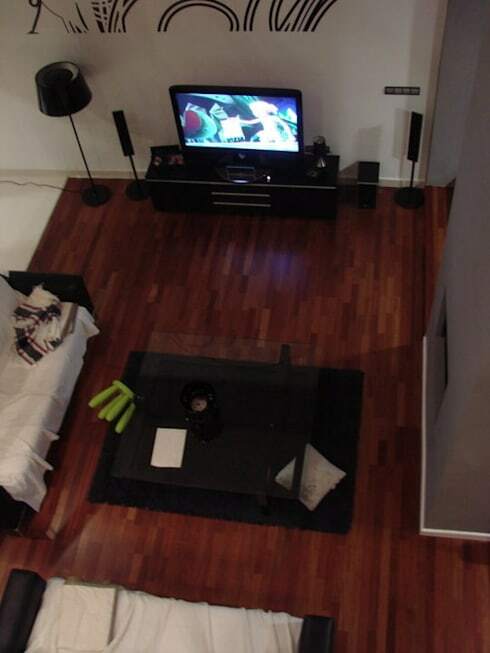 Look how this space is enhanced by a beautiful, abstract piece of art. Lighting is also important to note here. The architects have explained that they have chosen light that contrasts with the colder greys and whites in the house—warm against cold. 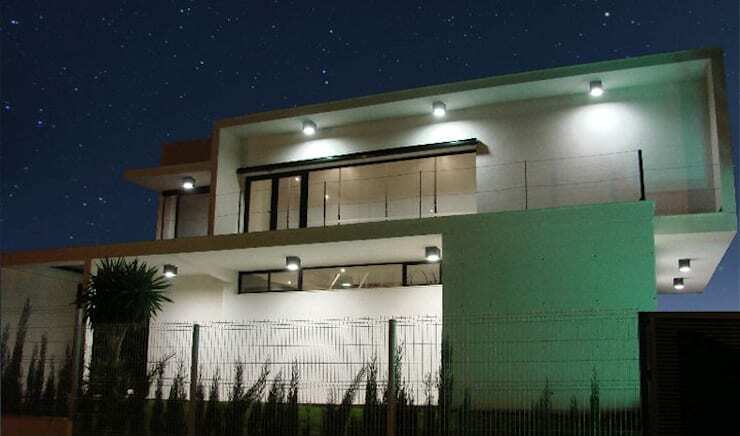 They have used lighting to highlight certain features and elements in the house. This is a great tip and a way to create ambiance and mood in your home in the evening. 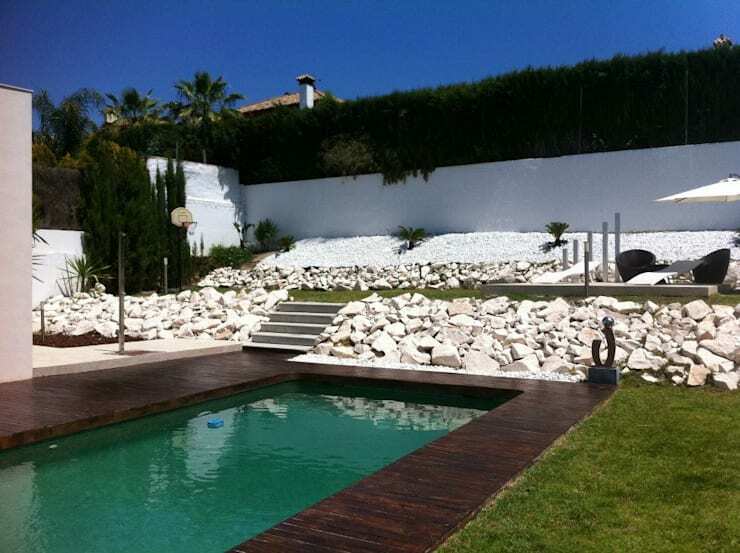 The house opens up onto a gorgeous back garden, with a luxurious pool. This is the ideal spot for families. Picture your kids playing here in summer, the evening braai's that you could host and the fun that you would have showing off this spot! Volumes play a role here as well. The designers have chosen white rock to enhance the different levels of the garden, defining the layers. Steps feature as well, further emphasising the different levels. White also contrasts brilliantly with the lush green grass, creating an outdoor landscape design of the highest quality. The blue swimming pool is framed by a wooden perimetre, providing a smooth surface on which to place deck chairs or towels for sunbathing. The wood is also complemented by the white rock and the green grass. Garden furniture has been placed strategically in this area, designed for the ultimate in relaxation. Everything about this house is layered and rich in design, with the architects using every inch at their disposal. This is truly a home that speaks volumes. What most shone about this home for you? Please share your thoughts with in the comments!